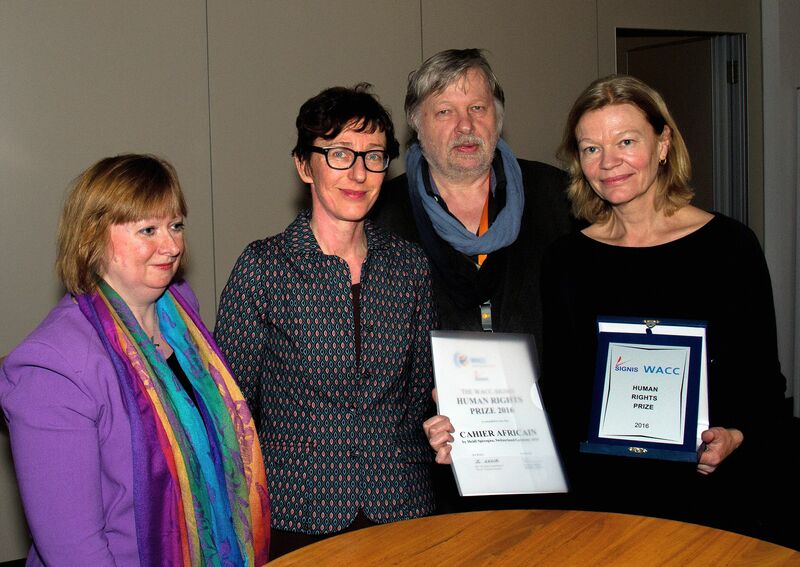 The WACC-SIGNIS Human Rights Award 2016 has been presented to the documentary film Cahier africain by Swiss director Heidi Specogna, who was recognized at an awards ceremony on 19 February in Berlin during the Berlinale film festival. WACC, the World Association for Christian Communication, and SIGNIS, the World Catholic Association for Communication, recognized the documentary for offering an exemplary human perspective on the horror of conflict situations that impact the lives of ordinary people, especially women and children. Cahier africain accompanies the victims of violence in the Central African Republic, such as Amzine who gave birth to a daughter after being raped, and Fane, who was shot in the knee and who eventually underwent successful surgery in Berlin. “WACC and SIGNIS believe this documentary offers a very human perspective on the horror of conflict situations that impact the lives of ordinary people, especially women and children,” said Marianne Ejdersten, WACC Europe vice-president and director of communication of the World Council of Churches, said in an opening address at the award ceremony. A lecturer in documentary filmmaking at Film Academy Baden-Württemberg in Ludwigsburg, Germany,Specogna has pursued a long and illustrious career as a documentary filmmaker, winning prizes for “Tupamaros,” a Coral Award winner at 1996’s Havana New Latin American Film Festival, and 2006’s “The Short Life of José Antonio Gutierrez”, which took a Swiss Film Award in 2006. In 2016, the Interreligious Jury at DOK Leipzig – one of the oldest documentary festivals in the world – awarded its prize to Cahier africain, which also won a Silver Dove for the best film on democracy and human rights. Rev. Dr Julia Helmke, president of the international interchurch film organization Interfilm, a WACC partner, said in her remarks, “Film is all about communication and communication rights.” Cahier africain is an excellent example of this, said Helmke, who mentioned the meetings with the refugees in the film.